It’s a saying said so often and for so long that no one seems sure of the origin anymore. With any goalie prospect, it becomes really hard to project ceiling and probability. Still, this far back on the list the lines become hazy. There is an argument to be made to swap the order of any the late ranked prospects and some of the players that just missed. 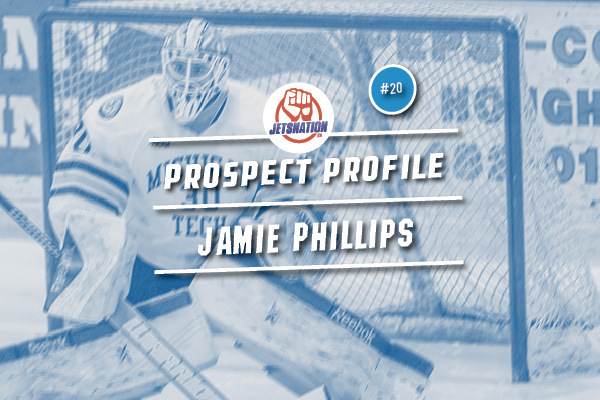 We here at Jets Nation decided to swing for the fences and go for Jamie Phillips, a netminder going into his senior year at Michigan Tech and looking to make a run after a breakout season. He kicks off our summer prospect profile series, checking in at #20. Goaltenders are hard to project, which is why the best process may be drafting them in the late rounds in bulk. Going heavy on NCAA netminders gives an additional two years of development as well. Phillips started his draft eligible season in the tier-II junior BCHL, although finished the year in a separate similar level league –the OJHL. The Jets brass were impressed with Phillips’ performance in these leagues, especially in the OJHL playoffs. Phillips was the second late round goalie drafted by the Jets, coming at 190th overall in the 7th round and two rounds after Connor Hellebuyck. Phillips spent the first two seasons of his collegiate career backing up the highly respected Pheonix Copley. Phillips posted marginal numbers over the two seasons, albeit at a small sample with only a grand total of 22 games. With Copley graduated to the AHL, Phillips had an opportunity to take the starting position and boy did he run with it. Phillips started the season hot, winning 10 games in a row and allowing two or fewer goals against in all but one game. The 21-year-old goaltender did come down to Earth to human levels, but still finished out the season strong. Phillips posted a .933 save percentage and a .744 win percentage that year, playing so well that Michigan Tech gave Phillips all but five starts. Phillips finished fifth overall in the NCAA in save percentage, while his six shutouts tied him for second. He then crowned his season with a nomination to the WCHA’s FIrst All-Star Team. His most impressive performance though was in mid March where Phillips shut down the door for nearly 120 minutes, earning shutout and the overtime win. Phillips then got the nod for the game the following day and still went without a goal against, essentially playing 3 games in two days without a goal against. All this is great, but still goaltenders are voodoo. It is far from uncommon for a netminder to post a single season of strong numbers in the NCAA and then never be seen again. The next season could set the table for Phillips’ career. With only one season over a 0.920 save percentage, a repeat performance may be needed to solidify Phillips’ chances in receiving an entry level contract when he graduates this summer. The Jets will have some interesting decisions to make in goaltending depending on how their netminders play this year. At the NHL level, Ondrej Pavelec will have one year remaining in his contract, with Michael Hutchinson being a restricted free agent. Top prospects Eric Comrie and Connor Hellebuyck will each have one and two years each of professional level hockey under their belts as well.